"A delicious one bowl dish"
Chicken Bouillon Granules - 2 tsp. 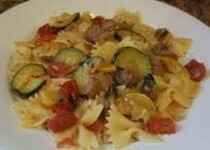 Place sausage in a large skillet over medium heat and cook until evenly brown; set aside. Heat 1/4 cup oil in skillet. Stir in garlic and onion, and cook until tender. 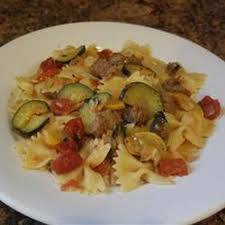 Mix in zucchini, squash, tomatoes, bell pepper and basil. Dissolve bouillon in the mixture. Season with red pepper flakes. Stir in remaining oil. Continue cooking 10 minutes.